Even though I spend a fair amount of time with InDesign, I wouldn’t call myself a designer. 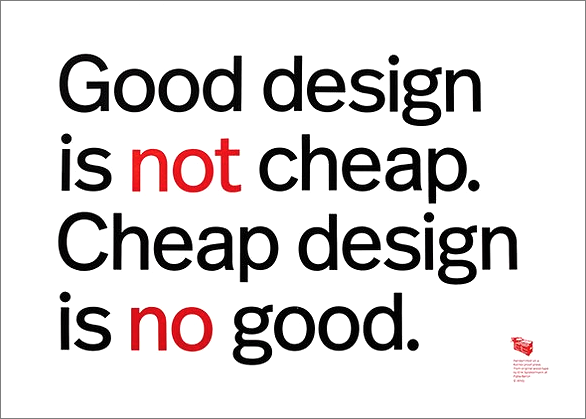 That doesn’t stop me from having a couple of things to say about design. In fact, on the Internet, you don’t need to know anything about a subject to have an opinion about it. So there you go…. This section goes into more detail on some graphic design fundamentals. Currently, the focus is on technical design basics but I hope to add artistic considerations as well at some point in time. Don’t forget to also check the font section, especially the pages about interesting, popular and hated typefaces. While working on those pages I ran into the poster below on the blog of Erik Spiekermann, the famous typedesigner. I may not be a designer but I spend years tinkering with other people’s masterpieces, trying to output them on a proofer, an imagesetter or a CtP device. Here is a long list of things that a good designer takes care of so that his or her job gets printed the way a customer likes it. Adobe InDesign is a pretty robust application but over the years I have had a few issues with it. This page contains a summary of InDesign troubleshooting tips and tricks that can be found on the web. I like the podcast of INDESIGNsecrets but the site is great as well. Notes on design is interesting. Allgraphicdesign has an incredible collection of links to design and prepress related sites. Publish & Jumpline – for the Dutch speaking design community. I am currently not subscribed to any design related newsletters. Suggestions are appreciated – please use the comment function for this. You can obviously visit the vendor forums, such as the extensive Adobe ones. Linkedin has dedicated groups about prepress and printing but tons of marketing blah-blah make them useless. I still prefer the independent forums. There are editions of this book for every version of InDesign. I loved earlier books by Olav Martin Kvern and still have fond memories of his ‘Real world’ book on PageMaker: in-depth information, knowledgeable, yet easy to read. The CS4 edition of this book is high on my shopping list. This book co-authored by the late Bruce Fraser is without any doubt the best overview about color management on the market. Hi just reading the comments. TIFF versus EPS, well in my learned experience I believe you use a TIFF when you are colouring a BITMAP file, you can’t convert the file to EPS and have the same results. Clipping paths will only work when the file is saved as an EPS. There are reasons why you would use one over the other. Printing processes also figure quite prominently when choosing different file formats. Print production/graphic design/prepress requires years and years of experience/training in this process people will gain a much richer/deeper understanding of file formats and many, many other areas. Standard leading for type is always 2 pt leading, so if you have 10pt type you would use 12pt leading i.e. 10pt/12pt. This is the industry specification but it depends on your eye and you can adjust it if you feel warranted. Golden rule never go less than 1 1/2pt leading type is too closed up then. I disagree, because the standard rule for leading is that it is 1.2 times the type size. For 10 point type, that is indeed a leading of 12 points. However, for large 200 point text in a poster the standard leading will be 200×1.2 or 240 points. With your rule it would be 202 points and that would cause characters to touch each other. Your article reminded me of a thought I had today; There should be a term for prepress-oriented ‘designers’ (like myself) who didn’t go to design school, but who are asked to design for the shop’s customers anyway. What we lack in educated design sensibility we compensate with technical knowledge. Love checking the blog to see if the spam is getting through the filters. That comment #1 looks fake to me too or maybe I have gotten paranoid over the years. You should google xrumer and check it out, that’s where a lot of the spam comes from nowadays. Spoiler: there is no good reason. Most people who use EPS do so because that is what worked ten years ago so they keep doing it that way. As for comment removals: fake e-mail addresses or URLs have that effect on me. I beg to differ, sure both are compatible file formats in the industry, and where I have mainly worked they prefer EPS file format to TIFF, but there are reasons why you would choose one over the over, particularly when creating artwork in photoshop, one file format supports different artwork techniques over the other. I use EPS for photos, TIFF for linework (that was the way I was taught in the industry through Uni/TAFE/industry/College. how dare you remove my valid and informative comment! Mr. Mubazzi Jnr. I aggree with your statement. Hi, I appreciate the Prepressure knowledge, it has helped me so much in improving my design skills, however i still wonder why some people prefer saving EPS to use in press istead of using TIFF. What is your view here? How would you advice? Hi PrePressure, I like the name, its how I feel about obtaining high quality work. To cut to the chaste, I am new to your site and will have to review the material to actually create a question that is not answered within the contents of the web. So three cheers to you! !